In my half-century as a baptised Roman Catholic, these current years with Pope Francis at the helm are easily the most exciting time to be part of the faith. I used to feel that during the John Paul II era as well, but this Pope has gone beyond all before him in reaching out to others, pushing boundaries and breaking stereotypes. When he was elected, and the news mentioned that he was the first Jesuit Pope in Papal history, I remember finding this odd, as the Jesuits are unquestionably a leading order among the various clerical orders within the Roman Catholic faith. I was thinking further about this at the recent, well-organised and extremely illuminating and thought-provoking conference “Towards a history of the Jesuits in South Asia: Post-Restoration Period” at the Xavier Centre for Historical Research, Porvorim at the end of last month. Given that the Jesuit order began in 1540, and there was a long suppression, beginning in 1773 and ending in their Restoration only in 1814, with their re-emergence in many parts of the world even later for logistic reasons, it made more sense. But it also dawned on me that Pope Francis’ path-breaking, hard-hitting ‘Laudato Si (Praise Be to You): On Care of Our Common Home’, his 2015 encyclical on the environment and climate change, is a logical extension of “Finding God in all things” which is at the core of the spirituality of Saint Ignatius of Loyola (1491-1556), founder of the Society of Jesus; indeed this idea is contained in the very beginning of the spiritual awakening of Saint Ignatius, in his Spiritual Exercises, composed by him before he had even become a priest. Although the encyclical gets its title from and begins with a quote from the beautiful canticle ‘Laudato si, mi Signore’ (Praise be to You, my Lord) of St. Francis of Assisi (whose name this Pope took as his “guide and inspiration when elected Bishop of Rome”) and refers to him extensively, the influence of St. Ignatius seems evident as well. In addressing climate change head-on in the very first chapter (‘What is happening to our Common Home’), Pope Francis effectively rebukes those (for example the Evangelical far-Right in the US) who use the bogey of religion as a spurious argument against the very notion or existence of climate change as an entity and a major problem facing our world today. 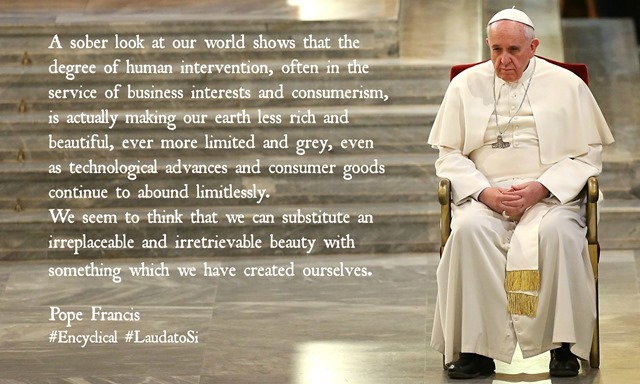 Laudato Si is a lengthy read, but just a few pages into it one can easily understand why Fr. Bismarque Dias was so excited when the encyclical was released, barely a few months before his brutal murder in November 2015. This is the great Goan paradox: while the world media lauds India for cancelling plans to build nearly 14 gigawatts of coal-fired power stations due to solar energy prices falling to record low levels, we in Goa seem to be in reverse gear, with a coal hub being foisted on us even as the rest of the country wipes its hands clean of coal. Isn’t it bizarre that at the same time that some £6.9 billion-worth of existing coal power plants at Mundra in Gujarat are deemed “no longer viable because of the prohibitively high cost of imported coal” and when investors the world over are showing interest in India’s burgeoning solar energy sector, that a regressive coal hub is proposed in our backyard? Daal mein kuchch kaala hai, and it is likely to be the highly polluting kaala patthar and everything that comes with it. It has been two years since ‘Laudato Si’ was published, but it is my view that we the faithful have collectively not taken the time to read it, meditate upon its many messages and transform our own thinking, actions and way of life. If we bear in mind just this message, we will not cut a hill; and think well before cutting a tree, or depleting our earth and water and air through mining; we will not pollute our oceans, rivers and lakes; we will not allow air, water and soil to be polluted by coal or any other pollutant; we will shun plastic. And we will not harm or allow harm to those less fortunate or more vulnerable than us. For we will see God in all beings and in all things.